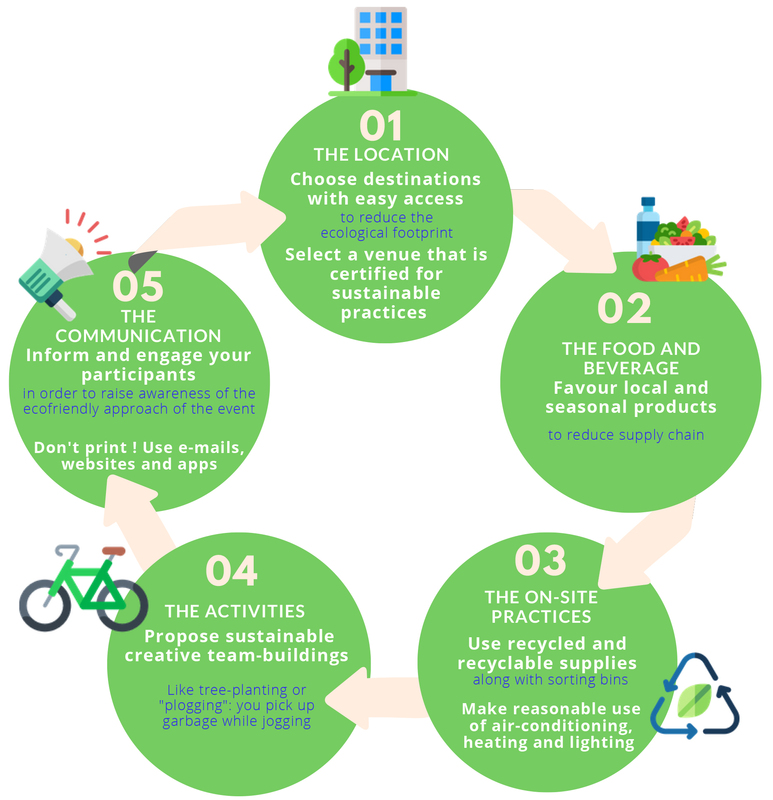 How to organize your environmentally friendly event? Organizing an eco-friendly seminar, incentive or meeting isn’t just improvised… quite the contrary! To limit the environmental impact and to run a professional event taking environmental considerations into account, you need to combine a wide variety of best practices. Instructions! Two major questions come up when it comes to choosing an environmentally sustainable host location. The first: is the desired location eco-friendly? This means that it is equipped with efficient systems for managing its energy (electricity, water, waste sorting, etc.) In order to assess whether it does, there are a number of recognized certifications, starting with Green Globe. This international label certifies the environmental and social management of tourism organizations. The second question: is the establishment easily accessible? Choosing a place in a rural area isn’t enough if it is far away from the main roads, stations or airports. It is important to choose a place close to cities in order to reduce travelling distance and thus the ecological footprint of your participants’ and service providers’ transportation. For example, Monaco is less than 30 kilometers from Nice Côte d’Azur International Airport. A professional event often gathers a large amount of participants. They have to be(well) fed, which entails a major environmental impact. To be eco-friendly, use short supply chains! Offer cuisine made with local and seasonal products. Do away with plastics and toxic bad habits, use recycled paper, pens and waste sorting bins. To reduce energy consumption, you need to develop good habits such as employing reusable items, which can be easily disassembled and stored, or even making more sensible use of air-conditioning, heating and lighting. When you say seminar, you mean team-building and incentive activities. Proposed events these days vie to be the most creative! However, they also need to be eco-friendly. Here are some wise choices: plan workshops for building things out of recycled materials, choose outdoor classes such as yoga or sophrology, plan “plogging” (a jog where you have to pick up garbage found along the way) or even do some tree planting. This is an activity where you’ll be able to notice the social and environmental benefits. Arboretum de Roure, which Prince Albert II sponsored, is the perfect example. It’s recommended to inform and engage the participants beforehand in order to raise awareness of the eco-friendly approach to the event: teaching about the destination and its ecosystem, organizing workshops or even reminding participants about environmental best practices can lead to increased adherence by employees. They will also be able to take the right course of action during the event. However, be careful about how you are going to communicate this to them and favor the use of digital media: email, websites or mobile apps. However, if you do need to print, choose recycled paper and print on both sides. There are also Imprim’Vert-certified printers where the goal is to favor the implementation of specific actions which lead to a reduction in the activity’s environmental impact.